STIHL brushcutters don't follow the well-beaten path - they make their own with a big saw blade. 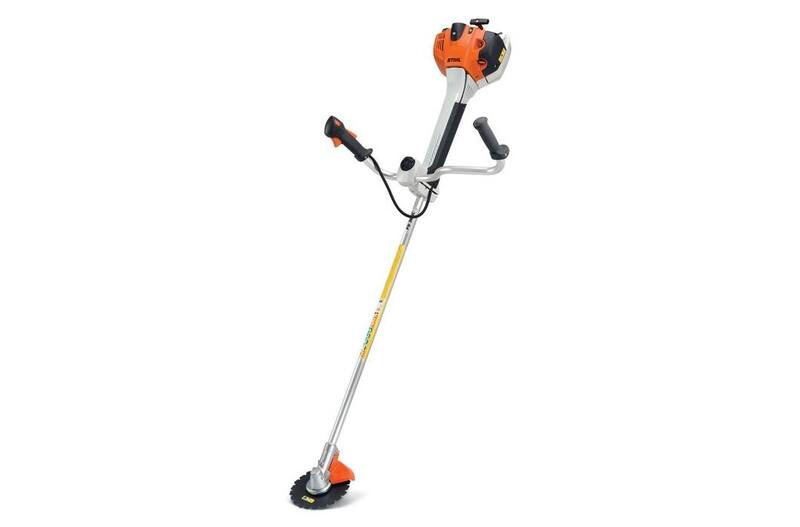 The STIHL FS 360 C-EM brushcutter has a low-emission, fuel-efficient engine. It also features the STIHL M-Tronic™ engine management system, which adjusts the engine to compensate for changes in operating conditions, thus maintaining optimum engine performance. Ideal for cutting thickets and thinning wild growth, this brushcutter can take on heavy clearing jobs while remaining environmentally conscious. It also boasts a vertical pleated air filter for long service life. A great convenience feature is its easy-adjust handle bar which swivels for easy transport and storage. The STIHL FS 360 C-EM also features our Easy2Start™ system - making starts fast and easy - and a simplified starting procedure with semi-automatic choke lever and momentary stop switch which automatically returns to the start position so it's always ready to get to work. This brushcutter even includes a four-point anti-vibration system and an extremely lightweight universal harness for optimal comfort. Electronic ignition: Electronic ignition provides easier starting and smoother running. STIHL Easy2Start™: The STIHL Easy2Start™ system makes starting STIHL outdoor power tools almost effortless, eliminating the need for a strong pull of the starting cord. This advanced starting system is designed to make starting STIHL products easier. The specific system may vary by model, but in each case, a quick pull overcomes the engine's compression to minimize the strength and effort required to start. Available on selected products. STIHL M-Tronic™ System: The STIHL M-Tronic™ system intelligently manages the operating performance of the engine. Equipment performance can be affected by a dirty air filter, changes in elevation or poor fuel quality. The STIHL M-Tronic™ system compensates for these factors by eliminating the low and high-speed carburetor adjustment screws and electronically monitoring the engine and digitally controlling the fuel/air mixture. This new technology also provides a simplified warm start procedure. •Weight without cutting attachment or deflector.